Cloudflare vs Incapsula: Which Is The Best CDN Provider? Content Delivery Network is one of the most important tools when it comes to maintaining a website. CloudFlare and Incapsula are both very renown for their CDN services. 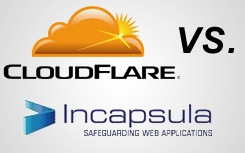 Let’s discuss deeper on both CloudFlare vs Incapsula for the best CDN provider. As for the record, this review is done with some testings and cross referencing the results with other sources to ensure that you are getting the right information. What makes both Cloudflare and Incapsula different? So what makes them so different? How to choose the best free CDN for my website? If you would like to compare, both basically offers pretty good security features. If you would need to compare them neck to neck, Incapsula offers a better protection against all types of DDoS threats. Cloudflare does a pretty decent job when it comes to protections but it comes short if you are looking for a CDN which offers great defense against unwanted threats. Both Cloudflare and Incapsula offer their users reports to show the progress of the CDN. The reports range cover much of the basic information such as bandwidth used, threat experienced by the site, the number of bots and even the number of unique visitors visiting the website. When compared, I would personally prefer Cloudflare’s report as it is more detailed and offers slightly more information that I required in just one glance. Basically, I give the winning score to Cloudflare as the layout is easier to see and users do not need to navigate any further to get additional information. When it comes to optimizing, Cloudflare seem to be able to optimize my sites better than Incapsula. Various tests were done after installing for 48 hours to give a fair detail of time. After running those tests, it is pretty clear that (if I would give a score of 10), I would give Cloudflare a score of 9 and Incapsula a score of 7. Which offers a better page loading speed? I am pretty sure most of you guys are interested on this part generally. Cloudflare is definitely the winner here with a faster load of an average 0.5 seconds. As little as this seems, it is everything for many search engines and even high traffic sites. Cloudflare could have won this battle at this time of the writing because it has more servers around the world compared to Incapsula. At the moment, Cloudflare has 28 servers around the world and Incapsula has only 14 servers. This could be the main reason why sites using Cloudflare could load slightly faster than Incapsula. Related article: How To Configure CloudFlare Page Rules? Why not you try them today and give me your feedback? For those using either one of them, which is your favorite one among both? *If you like this article, could you please share this for me using the red Google+ button below? My name is Igal – I`m a product evangelist for Incapsula. This article showed up in my Google Alerts today and after reading it I have to say that it's a very interesting overview of both platforms. As you've correctly stated, CF free plan will provide better acceleration. However, the difference is marginal. All comparative reviews I've seen so far show that, at best, CF will provide 3%-5% additional speed boost – over our free plan*. This sounds right to me because, unlike Cloudflare, we don't focus on acceleration or on our free offering. Incapsula is a business oriented, security focused CDN for SMB and SME clients. As a result, as you've correctly stated, our focus is website security DDoS mitigation. Overall, its a question of need,cost and value. When looking for free CDN for acceleration, Cloudflare might be a better choice. When looking for security oriented solutions, Incapsula will provide a better alternative. In the end you have to ask yourself, what's more important to me? Right now, we are putting our money and development muscle on security. First of all, thank you for your long explanation. Of course, thank you for visiting my website as well. Even though I did several tests with both Cloudflare and Incapsula, I was (and still) impressed with Incapsula. Yes, you are absolutely right in terms of speed where Cloudflare is slightly faster. However, I have to stress that Incapsula performed much better than what I actually expected. Overall, I was happy with Incapsula and therefore, I have several websites as well which are running on Incapsula. Nonetheless, thank you for the time reading and commenting as well. Certainly hope to see more competition and Incapsula, improving over time even further. Thank you for your comment. Glad you found it useful. Hope you will be back for more! Hello Reginald Chan, Nice to see to you here. I am not aware about Incapsula, because I have not experienced it so far. My website is on Cloudflare since few months with free plan. What I was noticed that when I joined the CF my website has performed well. Since few days, my website is encountering the issue server response; it is taking much time to load and very frequently my website is going offline. This type of circumstance causing me a confusion that whether my website is online or offline, when my website if online and offline. This is because when I look at analytics I find no visit to my website and traffic to my website is drastically downed since few days. I am unable to understand the reason behind the issue. Can I guess that it is because I joined in free plan, and if I go for Pro plan, can this issue be solved? I think there will no role of my hosting company regarding server response or website loading time, once I joined CF, if I am correct. Here I request a suggestion if you like to help me, how to keep my website almost online and how to improve server response. Thank you for your enquiry. Well, in my opinion, it does seem like it comes from your hosting provider itself. Basically, Cloudflare works as a platform or a medium between you and your hosting company. For me, I would logged a report with both your hosting company and Cloudflare. I experienced the same issue before and honestly, the issue was from my hosting company. I had several websites on the same host and did some test (a few with CF and some without). What I am saying is that you should get your hosting company involved. Some hosting companies actually oversell their products which, leads to many downtime. Upgrading to CF pro actually just provide a better feature but it still doesn't solve the hosting issue. Nonetheless, I hope this simple explanation works for you and hey, if you have a problem, contact me! I am more than willing to help you out as much as I can. This is a great review! I need to implement one of these systems, but wasn’t sure which to choose. Looks like I will be trying Cloudflare first. Thanks for that 🙂 Hope you liked it! I’m pretty sure you won’t go any wrong with either one of those! Nice Post with good comparision I think Cloud Flare is better than Incapsula what do you think ? I would say both has pros and cons. I noticed both CloudFlare and Incapsula had been ‘upgrading’ a lot recently. However, I would say in terms of speed, always go for CloudFlare. If you are looking for bulletproof security, Incapsula is good.